At the bottom of this article, I share an update of my stock portfolio. Each position’s cost basis and relative weight are shown, but not its value, as I have done before here and here. I also list my sales, although I’ve only sold three stocks in the 5.8 years since I first bought Apple (NASDAQ:AAPL) (the labeled “Held” shows the weighted average number of years since purchase). I’d welcome any feedback as I am always trying to improve my game, albeit as a part-timer! In December and January, I added introductory positions (~2.0% of portfolio) in two REITs: CyrusOne (CONE) and Ventas (VTR). Ventas just reported Friday, saying it “expects 2019 to be a pivot year and its transition back to growth.” Ventas is a safe, high-quality REIT (senior housing, triple-net and office, including a smart focus on university-based research) temporarily suffering from the senior housing market’s overbuild, but for which it is well-positioned beyond the current cycle. My forward dividend yield is 5.50% ($3.17 ÷ my cost of $57.16), and the current dividend yield is 4.93%. Five REITs now comprise ~9.1% of my portfolio (AMH, CONE, DOC, INVH, and VTR). To help make REIT decisions, I am highly influenced by Brad Thomas’ newsletter and his SA articles. 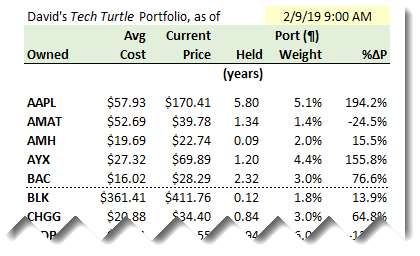 I am also influenced by Hoya Capital Real Estate (who is great at summarizing the top reasons to be bearish/bullish and REIT sectors, as in Single-Family REITs) and by Colorado Wealth Management Fund (e.g., Why Own When You Can Rent). A new position in Redfin (RDFN) on 12/3, a technology company somewhat disguised as a real estate company. A new position in American Homes 4 Rent. I already held Invitation Homes and, liking the risk/reward profile of single-family rental (SFR) theme over the long-term, decided to cover both bases rather than sweat pros/cons between two category leaders.